Earlier this evening, I intercepted this email between one of our customers (James) and one of my colleagues (Dennis) on the Subject of AS1851:2012 - Monthly Sprinkler Testing. The email was in response to the publication of Australian Standard AS1851:2012 that was published on December 3, 2012. I have received an email from South East Water on the Water Metering and Servicing Guidelines which commence on 1 July 2012, incorporate new Australian Standards on backflow prevention valves. 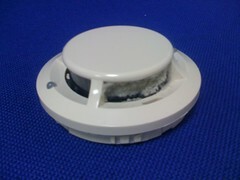 Fire Detector Maintenance - Even kids can identify a problem! Earlier today, my 11 year old daughter sent me an email with an attached photograph. The photograph was of a smoke detector she observed in a private medical clinic that she described as "Yucky!"